The IC Chef Cookbook features more than 260 recipes submitted by IC patients over the past ten years to our on-line cookbook. 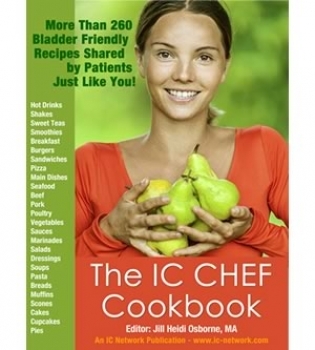 Julie Beyer RD, author of the Confident Choices: A Cookbook for IC and OAB, contributed the foreward to the book. 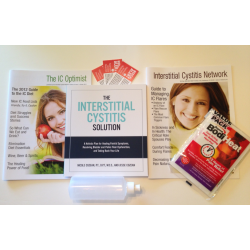 She wrote "For the past twenty years, Jill Osborne and the thousands of members of the Interstitial Cystitis Network Forum (www.ic-network.com/forum) have shared their journeys with interstitial cystitis, including the recipes you find in this book. This cookbook is a celebration of that wisdom and, more importantly, the empowerment that patients experience when collaborating with each other. If you think there are no hot beverages that you can enjoy, you'll be intrigued by the more than 20 recipes for hot drinks included in the cookbook and, with the warm season approaching, you'll also find recipes for frozen shakes and creamy drinks, sweet teas, smoothies and veggie drinks. If you're sick of oatmeal for breakfast, you'll find some fabulous new recipes perfect for a family brunch. From burgers to pizza, pasta to vegetarian ideas, there are plenty of options that should help you enjoy food again. The book is more than a cookbook. It's a primer on the IC diet as well with easy to read sections explaining why food can irritate the bladder, and the most irritating foods to avoid. It includes a full list of the 2012 IC Food List along with articles on Fighting Constipation, Fatigue Fighting Foods, Foods and Chemicals and more. We hope that it gives you some great new ideas and fresh flavors to play with. 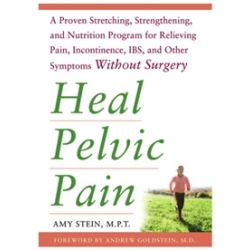 The book is appropriate for patients struggling with bladder and prostate disorders as well as acid sensitivity.